What inspires me: Nature and the ordinary people working to protect it. My motto: Follow your passion despite your fears and make time to enjoy the moments along the way. Best advice: The next big idea you have, just start doing it. It’s the small steps that build momentum. Don’t die with a mind full of great ideas, the world will lose out. Give yourself space to just be, immerse yourself in beauty and connect to the world outside of you, clear your mind, listen to your heart and have fun romping around your imagination. Play and give yourself time to think. Hang out with positive people and avoid the negative talk. I remember in my office in Fremantle I had an armchair and my walls were covered in photos of my travels, artists work, poems, Leuning cartoons and anything that was beautiful and inspired me. Every day I’d find time to sit and ponder and then I’d work really hard. It was after nightfall that an eight-year-old Rebecca Millar followed her guide into the womb of an old-growth forest. Switching off her torch, she waited for her eyes to adjust. And there before her was the land of a fairy-tale. Hundreds of glow worms lit up the mossy forest banks with mystical pinpricks of light. She gasped at their beauty, her face a picture of wonder. The image of this enchanted world stayed with her long after, a memory that so perfectly captured the magic of Mother Nature. So when she later learned that such habitat was to be logged, she was aghast. “I just thought, you can’t destroy a fairy-tale,” she says. “I’d always had this faith in adults but suddenly realised that they could do these terrible things.” And so began the stirrings of a fierce determination to protect what she loved, to consciously live in a way that would nurture our planet. So it was that a teenage Rebecca became something of an environmental activist. She’d attend anti-clearing protests, hang up anti-whaling or logging posters at school and argue for an antinuclear future. She revegetated Bushy Creek as a volunteer and wandered Melbourne’s remnant bushland with naturalist friends. Aged 18, Rebecca hitched a ride from her middle class Melbourne home to join a protest against the logging of old-growth forests in East Gippsland. She camped here for two weeks, a sleeping bag thrown on the ground wherever she could find a space between the activists in this makeshift commune. The band of environmental warriors chained themselves to trees and screamed slogans at the would-be loggers. Rebecca watched as a grimy protester declared his angst at the logging. And she watched a well-dressed logging company representative responded calmly, well-spoken and well-balanced in his replies. While she agreed wholeheartedly with the protestor, she suddenly realised the importance of protest backed by rationale. “I realised you need a voice but, to make real change, you have to tackle it in a strategic way, or in a way that provides scientific evidence for your arguments,” she says. And that is what the Environment East Gippsland group went on to do. But not before 129 protestors were arrested. Back in Melbourne, Rebecca would attend meetings where young people fired by high ideals would debate how to save the world. She was at talks that conceived the idea of Friends of the Earth’s anti-nuclear campaign, she argued the merits of socialism versus democracy. She and her friends crowded tiny inner-city apartments to recite literature and poems and paint wild murals on living room walls. These were highly charged times and Bec was swept up in the feeling of revolution. These were highly charged times and Bec was swept up in the feeling of revolution. Around the time Rebecca was protesting, she experienced her first serious case of self-doubt. She’d long dreamed of becoming a sculptor and had invested countless after-school hours developing a portfolio to finally become accepted into the prestigious Victorian College of Arts. Safe in the knowledge she’d been accepted, she hadn’t considered alternate career options – until a careers counsellor said she’d need to put more than one choice on her college application form. Her parents suggested considering other options. What else was she passionate about? The answer was easy – the environment. 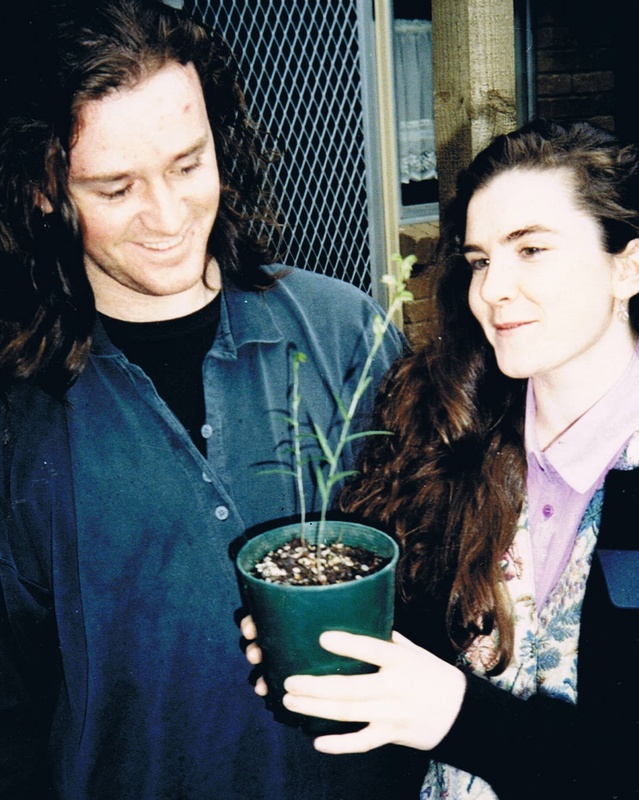 And so Bec applied to study environmental horticulture with dreams of restoring landscapes. The artist had turned scientist. But she was soon to discover the transition would be among the hardest of her life. Thanks to a kindly lecturer she discovered the ‘error’ had been submitted by a lecturer who had fought to have her kicked out of the college. To her horror she also discovered 40 per cent of the women had also been told they’d failed. The experience made Bec hell-bent on proving the university wrong. “It just reinforced that belief in myself – that it’s worth fighting for something even when everyone is doubting you,” she says. And prove them wrong she did, graduating another 2.5 years later with a degree in applied science. It was on her first day of her new job teaching unemployed youth about land care that a recently graduated Rebecca found herself amid a band of unemployed teenagers, not much younger than herself. Milling about at a rubbish tip that was to be restored, the scowling youth dragged on cigarettes, scuffed their feet, hands shoved in pockets. Two lit up a smoke in a tunnel they’d dug beneath a towering pile of mulch. Such was the success of the project that Greening Australian head hunted Rebecca as an environmental supervisor where she again worked with unemployed to restore landscapes but on a much bigger scale. She loved the job. And yet, she’d always dreamed of travel, of visiting far flung wildernesses, experiencing cultures foreign to her own. So one day, fearing she was falling into a comfort zone that would be difficult to escape, she simply booked a ticket for a year’s travel throughout Africa and South America. Her family was shocked. John couldn’t understand that she wanted to travel alone. But she was determined. This was something she needed to do for herself. She cut the trek short but, as if to prove her sense of adventure was still in check, she quickly accepted a rare invitation to attend a ‘native drumming’. After nightfall, she boarded a canoe and paddled down inky black waters, then walked one and a half hours through scrub and farmland by torchlight. Finally she entered a village, smoke spiralling from fires within huts and hillside trails lit by the lanterns and blazing sticks of dozens of people descending onto the village for the event. Men in red, white and blue tunics began spinning wildly. The sound of drums filled the night. A head priest walked out, touching people who’d collapse convulsing, screaming, like they’d been possessed. Bec, the young white onlooker, was entranced, brimming with a sense of privilege, overjoyed that people were continuing their traditional lives unhindered by the Western world. 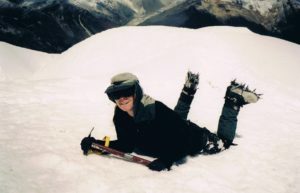 Fired by her African adventures, Bec boarded a plane to South America. Again her parents fretted as she travelled to areas gripped by the Shining Path’s guerrilla war. She ventured to the womb of the Amazon to the Jatun Sacha research station where she did yoga on riverside rocks, brushed tarantulas from her tent, scaled trees with a chainsaw to study the species that inhabited the tree tops, narrowly avoided death by quicksand and travelled atop a train to cross the Ecuador-Peru border with dozens of others who couldn’t fit into the carriages. She climbed her first mountain, leapt across ice crevices with ice picks, completed a 10-day solo trek of the Andes. She felt unstoppable, adventurous, in love with the world. Until she was struck deathly ill alone in a cheap hotel room. She felt unstoppable, adventurous, in love with the world. Life back in Melbourne continued in a whirl of work on landscape restoration and leisure time brimming with art galleries, shows, markets, comedy performances, rock climbing, camping and trekking. Rebecca and John hooked up again and, when John accepted a job in Fremantle, Bec was willing to follow him. It wasn’t long before she was working with Greening Australia WA, where she later became state manager. Soon she was travelling to Canberra to lobby politicians – finally protesting in the manner she first envisaged all those years ago among the activists in East Gippsland. This was activism backed by science. And life was great. They’d ride bikes all over Fremantle, grew a native garden and vegie patch, learned to scuba dive, had great friends who’d meet for crazy banquet dinners, where they’d discuss how to make the world a better place. 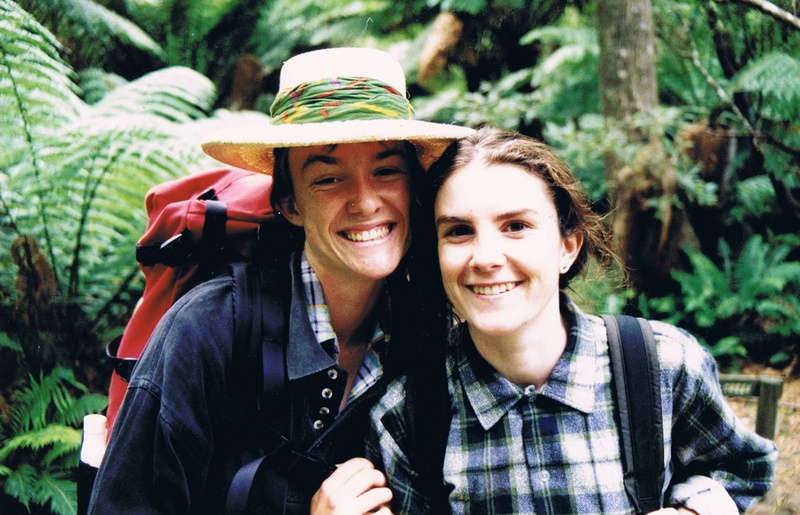 Around this time Rebecca started to realise the importance of being across all issues facing WA, not just conservation. So she applied and was selected for the inaugural Leadership WA program where she was exposed to the big issues, leaders from all fields and a network of highly motivated professionals from all walks of life . This was the life she’d dreamed of. So, when John suggested they start a family, Bec was terrified of taking the leap. She’d already married and been dragged kicking and screaming into home ownership – fearing a mortgage marked a slippery slope away from the adventurous, conscious living she’d embraced. But kids. This was a terrifying prospect. She felt she was at her prime and wanted to use her new leadership experience as a catalyst for change. However, she finally agreed to at least stop using contraception, and fell pregnant at the first attempt. A few years later, sitting atop a giant boulder overlooking the emerald seas of Greens Pool near Denmark, Bec and John decided they wanted to eventually move to the country. Within three months John had been offered a job working on the beta-carotene project at Port Gregory’s Pink Lake – and the chance to study a PHD for the WA Department of Fisheries, in Spain. Bec was all for Spain, but John knew he didn’t want to stay in government. So came the decision to take the job at Port Gregory and move to Kalbarri. Bec’s friends advised her against it. You’ll hate it, they said. What will you do for work? 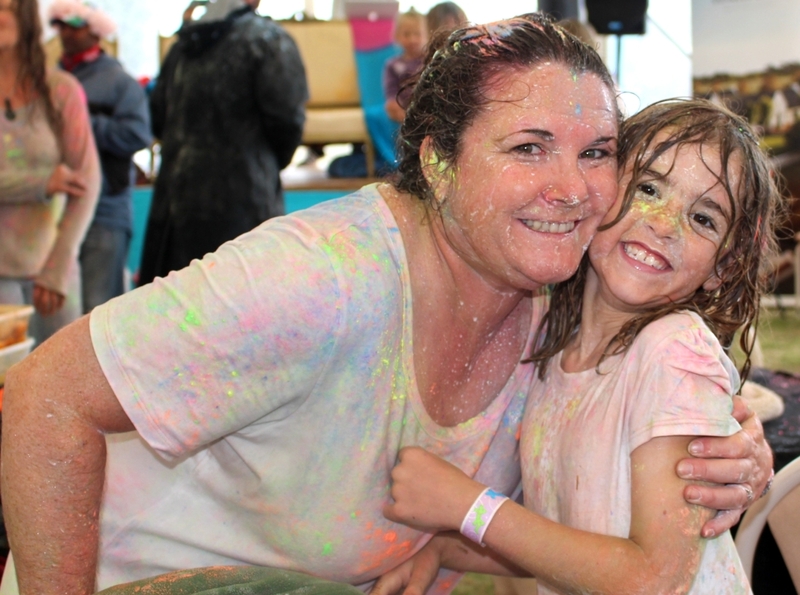 How will you fit in – an activist amid beach-going mums? But Bec was unperturbed. She approached the move as though she were indeed living in another country. 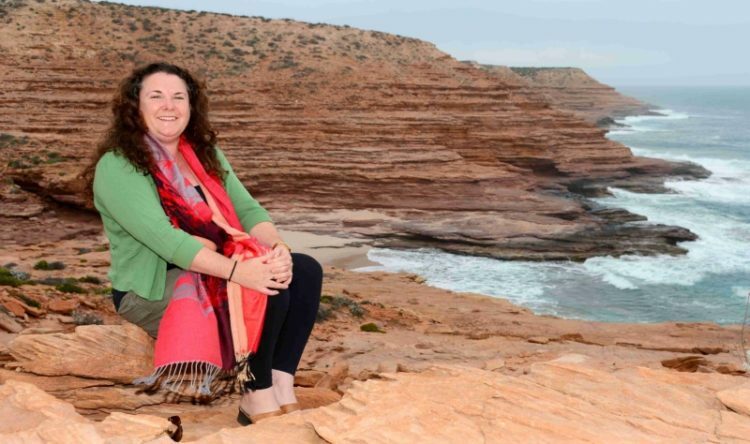 She studied Kalbarri’s history, she immersed herself in its stunning surrounds. She joined the social enterprise group, Pollinators, in Geraldton. She asked the Nanda Aboriginal people to welcome her to country. And in this way, she learnt the remarkable tale of the Zuytdorp – the Dutch East India Company merchant ship which had sunk on the cliffs north of Kalbarri 300 years ago. Thankyou for providing such an inspiring story to help me get to know Rebecca better.